War on the Korean Peninsula appears to be a greater possibility today than at any recent time. President Trump insists he will not allow North Korea to develop the capability to target the U.S. homeland. Meanwhile, Supreme Leader Kim Jong-un refuses to abandon a project he believes to be necessary to guarantee his regime’s survival. The problem of intention is exacerbated by the threat of mistake and misjudgment. Two impulsive blustery leaders of uncertain temperament are facing off. With threats flying, military forces moving, and WMDs testing, much could go wrong. Yet President Trump appears to be doubling down on his strategy of maximum military pressure. He continues to threaten war by sending U.S. carrier groups and bombers to Northeast Asia to demonstrate Washington’s resolve. American and South Korean forces are also conducting military maneuvers. The allies insist that “Vigilant Act 18” is merely a standard, annual exercise. But it comes at an unusually sensitive time. The administration apparently presumes Pyongyang is not aware of American military power. But it is. U.S. armed services are the strongest argument for the North developing nuclear weapons and ICBMs. At the end of the Korean War there was little left in North Korea to bomb. When I first visited the Democratic People’s Republic of Korea 25 years ago, officials commented that they had to completely rebuild Pyongyang. America’s capacity to destroy is even greater today. Then, at least, China came to the DPRK’s rescue. But today the North cannot count on similar aid. Beijing might act to preempt an American advance to the Yalu; it would not, however, intervene to preserve the Kim dynasty, especially if the latter bore at least some responsibility for starting the war. Russia would be even less inclined to act. Nor does Pyongyang only fear conflict arising from the peninsula itself. Since the end of the Cold War the U.S. has routinely targeted regimes it dislikes: Panama, Somalia, Haiti, Serbia, Afghanistan, Iraq (twice), Syria, and Libya. The latter is particularly striking: Moammar Gaddafi made a deal with the U.S. and Europe to abandon his nuclear and missile programs, only to be ousted when his supposed new friends found it to be convenient. For North Korea, the assurances of Secretary of State Rex Tillerson, who doesn’t even speak for this president (let alone a future one), are of little value. So the DPRK is aware that America has substantial military power and is willing to use it. The chief danger now may be that Pyongyang ends up believing the Trump administration is preparing to act when it is not. When I again visited North Korea in June, officials were particularly concerned about Washington’s intentions. Other presidents have affirmed their willingness to take military action. Trump has made the threat repeatedly. He has ramped up the rhetoric, talking of delivering “fire and fury,” and repeatedly sending U.S. military forces, which he once referred to as the “armada,” to threaten the North. His officials, as well as militaristic members of Congress such as Senator Lindsey Graham, have spoken of the near-inevitability of war unless the DPRK surrenders to Washington’s demands. It is difficult to know what Pyongyang—or America’s allies, for that matter—make of the administration’s plans. But to the extent that North Korean officials take the president’s rhetoric and actions seriously, they are likely to perceive a heightened threat of war. And that is likely to make the DPRK trigger-happy. While U.S. officials are talking about a preventive war, which differs from preemption in the lack of any imminent threat, the North is likely to consider the need for actual preemption. North Korea’s problem is that the U.S. and South Korea possess vastly superior conventional capabilities, and allowing America to take the initiative, and especially to build up beforehand, would be suicidal. Of Saddam Hussein’s many mistakes, perhaps the greatest was to stand idle as the United States deployed its forces in preparation for war. He had no good options, but allowing Washington to prep at its leisure guaranteed his destruction. The DPRK faces the same problem. It has a quantitative edge, but its equipment is aged and the allies would rule the skies. Allow America to attack first, and it will quickly erode the North’s conventional capabilities. The ensuing conflict would still be costly, but ensure a more rapid defeat of the North Korean forces. So Pyongyang may believe it must use it or lose it. Wait for America to mobilize, reinforce its ground forces, and conduct massive bombing operations? Or strike to the extent it is able to—we don’t know the exact capabilities of the DPRK’s nuclear arsenal—first. 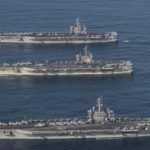 That is, if the Kim regime believed Washington was preparing for war, one could imagine missile strikes on Pusan, Okinawa, Guam, and other American bases in the region to impede any military buildup. Also likely would be a concentrated artillery and missile attack on Seoul, perhaps followed by rolling the tanks in an attempt to seize the Republic of Korea’s capital, which could be used to negotiate the Kim dynasty’s survival. The latter step might be backed by the threat to hit Tokyo. Exactly how a conflict would play out is impossible to predict. But most assessments and wargames predict massive destruction and casualties. The pessimistic counts are in the millions. After having spent 64 years trying to prevent a Second Korean War, it would be madness for Washington to trigger another potentially more catastrophic conflict, even inadvertently. While squaring the circle between the stated objectives of the U.S. and North Korean governments won’t be easy, the most important immediate goal should be to halt the seeming slide towards war. Accelerating missile and nuclear tests by the North and threats from Washington have ramped up tensions and made mistakes and misjudgments more likely. The Trump administration continues to insist that it won’t talk until the North agrees to denuclearize, that is, yield on the very issue to be negotiated. Pyongyang seems to believe that it faces a dangerous transition period, during which Washington might strike on the theory that the war would be “over there,” in Senator Graham’s approving words. If so, the DPRK understandably wants to acquire a full deterrent as quickly as possible. The more the Trump administration flexes its military muscles to demonstrate its seriousness, the more the North might believe that the moment has come. In which case it might believe it must act preemptively. Pyongyang once proposed a freeze-for-freeze, that is, suspending military exercises in return for freezing missile and nuclear testing. Beijing is pushing the same measure. The objection that the North is doing what it is supposed to while America and the South are giving up what they are free to do is true but irrelevant. Does the U.S. want to exacerbate or defuse the crisis? Does Washington want to increase or decrease the chance of war? Halting the threatening spiral upward would create some breathing room. Such a step also would enhance the likelihood of continuing Chinese cooperation regarding the DPRK. China long has insisted that Washington, not Beijing, bears the blame for the North’s nuclear program. Absent a U.S. “hostile policy,” China believes, North Korea would not be so determined to arm itself in such a way. Whether true or not, a serious U.S. attempt to defuse the crisis would increase the Trump administration’s leverage with China. First, Washington could offer to suspend the exercises—long criticized by the North—and develop a comprehensive benefit package for Pyongyang, long sought by Beijing. It would also need to press for unequivocal Chinese backing. Finally, such an effort should include negotiations over the DPRK’s future—how to protect Chinese interests in the event of a North Korean collapse or Korean reunification—and press for Beijing to back an American negotiating initiative with the threat of an energy embargo. The effort still might fail. The North might decide to go it alone no matter what. Kim Jong-un might decide to let his people starve before yielding his nuclear ambitions. But better to make the best effort possible—and especially to reduce the likelihood of conflict, intentional or accidental. War on the Korean peninsula is too awful to contemplate. Although deterrence and containment may be a second best when dealing with the DPRK, the U.S. followed the same policy in confronting Joseph Stalin’s Soviet Union and Mao Zedong’s China. The likely price of a preventive war, without persuasive evidence that Kim and his colleagues are suicidal, would be far too high. Which means the Trump administration’s highest priority should be to keep the peace. That requires more than not starting a conflict. The president also should reduce the pressure on North Korea to start one as well. He should ratchet down tensions rather than up. Preventing an accidental war would at least leave the possibility of finding a solution in the future. Next : Iraq, Syria, Iran…Are We To Destroy Iran Next?